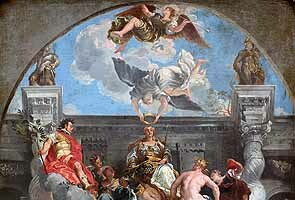 Paolo Veronese (Born 1528, Verona, Republic of Venice - died April 9, 1588, Venice) was an Italian painter of the Renaissance in Venice, famous for paintings such as The Wedding at Cana and The Feast in the House of Levi. 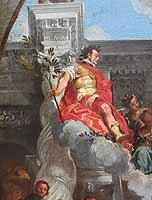 He adopted the name Paolo Cagliari or Paolo Caliari, and became known as "Veronese" from his birthplace in Verona. Veronese, Titian, and Tintoretto constitute the triumvirate of pre-eminent Venetian painters of the late Renaissance (16th century). 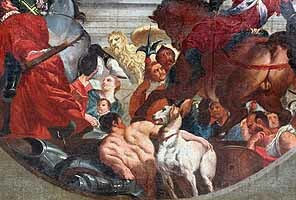 Veronese is known as a supreme colorist, and for his illusionistic decorations in both fresco and oil. 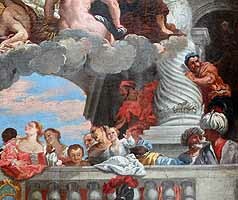 His most famous works are elaborate narrative cycles, executed in a dramatic and colorful Mannerist style, full of majestic architectural settings and glittering pageantry. 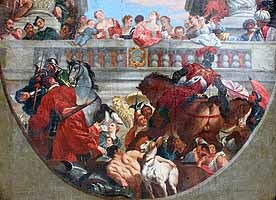 His large paintings of biblical feasts executed for the refectories of monasteries in Venice and Verona are especially notable. His brief testimony with the Inquisition is often quoted for its insight into contemporary painting technique. 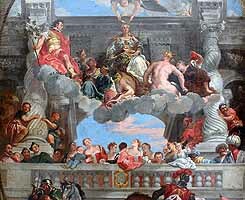 The Art of Paolo Veronese, 1528–1588. Exh. cat. Edited by W. R. Rearick. Washington, D.C., 1988. Nuovi studi su Paolo Veronese. Edited by M. Gemin. Venice, 1990. Pedrocco, Filippo, and Terisio Pignatti. Veronese catalogo completo. Florence, 1991. 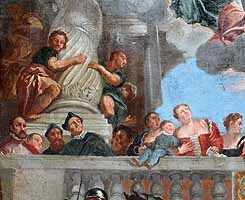 Pignatti, Teresio. 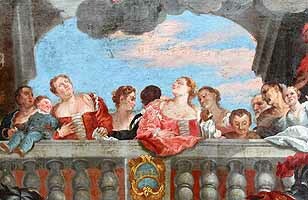 Veronese. 2 vols. Venice, 1976.